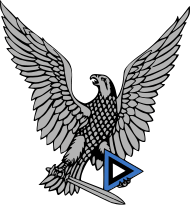 The Estonian Air Force (Estonian: Eesti Õhuvägi, listen ) is the aviation branch of the Estonia Defence Forces. The air force traces its history to 1918, and was established in its current form in 1991. As of 2016, the Estonian Air Force has a strength of 300 personnel, eight unarmed aircraft and several radar systems. Its main tasks are to provide surveillance of Estonian air space and support the country's ground forces. In addition, the air force hosts units from other NATO countries at its single operational air base. The roots of the current organization go back to the Russian revolution of February 1917, after which the Estonian state obtained a degree of autonomy within Russia, which included the establishment of national armed forces. Thus many Estonians in the Russian Army returned home to take up arms for their homeland. The Estonian Declaration of Independence in early 1918 was not recognized by Germany, which invaded and occupied the country during 1918. The Estonian armed forces were disbanded. After the armistice on 11 November 1918, the Estonian Provisional Government immediately set about establishing a military aviation unit. On 21 November 1918 Voldemar Victor Riiberg, the Commander of the Engineering Battalion, assigned August Roos to organize a flight unit. The Aviation Company of the Engineer Battalion began to establish air bases near Tallinn for seaplanes and land planes, but it was not until January 1919 that the first operational aircraft was acquired – a captured Soviet Farman F.30. In the meantime, on 22 November 1918, the Soviet Red Army had attacked Estonia and soon occupied most of the country. The fledgling Estonian Army, with foreign assistance, managed to counter-attack in early January 1919 and went on to liberate the country by late February. It subsequently moved on to liberate Latvia. Aviation Company aircraft flew a limited number of missions in support of the army. Following the February 1920 peace treaty with the Soviet Russia, the Estonian Army was demobilized, but the Aviation Company was retained. With the delivery of more aircraft it was reorganized as an Aviation Regiment (Lennuväe rügement), comprising a landplane squadron, seaplane squadron, flying school and workshops. More bases and seaplane stations were built. Some Aviation Regiment pilots were involved in a pro-Soviet coup attempt on 1 December 1924, but this was crushed within hours. From 1925 the First World War era aircraft were gradually replaced by more modern types. During 1928 the Aviation Regiment came under the control of an Air Defence (Õhukaitse) organization which included the Anti-Aircraft Artillery. In 1939 the Estonian Air force consisted of about 80 active airplanes (Bristol Bulldog, Hawker Hart and Potez 25 biplanes from the 1920s, but also the more modern Avro Anson multipurpose aircraft and Vickers Wellesley bombers) in three groups stationed at Rakvere, Tartu, and Tallinn. The Navy also maintained two multipurpose aircraft wings. Plans to acquire Spitfires and Lysanders from Britain were thwarted when the outbreak of World War II in 1939 forced Britain to cancel all export orders. After the defeat of Poland, Estonia was forced to accept a Mutual Assistance Pact with the Soviet Union, signed on 28 September 1939. 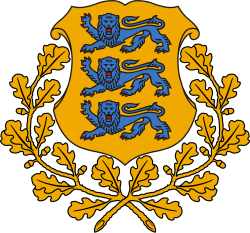 This allowed the Russians to establish military bases in Estonia, which were later used in the Winter War against Finland. On 17 June 1940 the three Baltic States were invaded by Soviet forces. Bogus Soviet-style elections were organised and the resulting communist parliament applied for membership of the Soviet Union. This was granted on 6 August 1940. During the June 1940 invasion the Air Defence took no action and subsequently aircraft remained locked in their hangars. The air force became the Aircraft Squadron of the 22nd Territorial Corps of the Soviet Army in the summer of 1940. On 22 June 1941 Nazi Germany invaded the Soviet Union. The speed of the advance was such that Estonia was soon cut off from Russia by German forces. The 22nd Territorial Corps was ordered to evacuate to Russia, but many Estonian personnel deserted and joined the guerrilla forces fighting the retreating Red Army. The Germans were welcomed as liberators when they arrived. During the subsequent Soviet presence, Estonia became heavily militarized, with some 10% of the population being Soviet troops based at over 500 military installations. The Estonian Air Force was re-established on 16 December 1991 after the restoration of independence of the Republic of Estonia in 1991. The Air Force was slow to reform because the Soviets had damaged or destroyed most of their infrastructure before leaving. 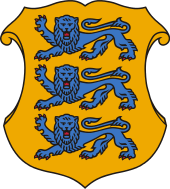 The Air Force Command and Control Headquarters was formed in Tallinn on 13 April 1994. In February 1993 the German government donated two Let L-410UVPs transport aircraft. In October 1994 three Mi-2 helicopters were delivered, followed by four Mi-8s in November 1995. Initially tasked with ground based air surveillance and air defence using only old Soviet radars and AAA equipment, on 15 May 1997 the Air Force moved into the former Soviet Su-24 base at Ämari, south of Tallinn. In 1997–98 two of the Mi-8's were upgraded. The Õhuvägi has been rebuilding the military infrastructure left by the Soviet military. Most of the funds have been directed to the Ämari military airfield which was completed in 2011. The objective of developing Ämari Air Base is to cooperate with NATO and partner nations air forces and being able to supply standardized airfield and aircraft services necessary for Host Nation Support. Due to the lack of modern and developed military aviation infrastructure, the Air Force development has been very slow. One of the main goals of the Air Force is to build up an air surveillance system, which will be the cornerstone of the air traffic safety and airspace control. The second priority is the development of the Host Nation Support capabilities for air operations with further implementation of crucial peacetime Air Defence capability – Air Policing. One important milestone will be the development of the air surveillance system to the level, which allows close cooperation with the NATO air defence system. The purpose of Ämari Air Base is to work together with NATO and partner nations air forces and provide the standardized airfield and aircraft services to provide the Host Nation Services. Structure of the Estonian Air Force. The Air Force Staff is highest command of the Estonian Air Forces and represents the military concept-developing, command and executive structure providing Air Forces peacetime, crisis and wartime leadership in order to reach, maintain and increase, as required, the operational level of the military subordinated structures so that to be able to operate under authorized commands responsible for military operations planning and conduct. The Air Surveillance Wing (ASW) is responsible for developing and operating systems to monitor all movements in Estonian air space. It also contributes to controlling NATO aircraft conducting Baltic Air Policing flights. The wing is headquartered at Ämari Air Base. Estonia's military radars and other sensors are integrated into the NATO Integrated Air and Missile Defence System. As well as providing data for this system, Estonian personnel serve in various NATO surveillance command and control facilities. Although the Estonian Air Force inherited a large number of former Soviet Air Force airfields in 1991 during the restoration of independence, most of them were disbanded within the early 90s due to non-existing need for such airfields. The Estonian Air Force has one active main air base and occasionally uses a civilian airfield in Tallinn. The modern Estonian Air Force has been rebuilding the destroyed military infrastructure since 1994 when the last Russian Army units left Estonia. Most of the funds were directed to the Ämari military airfield which was completed in 2011. Due to the lack of modern and developed military aviation infrastructure the Estonian Air Force development has been very slow. All aircraft are unarmed. GIRAFFE AMB Sweden Passive electronically scanned array 5 Mounted on a MAN tactical truck. 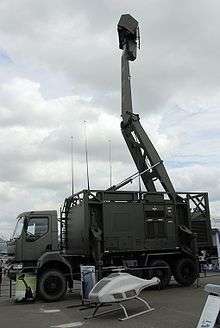 Ground Master 403 France Early-warning radar 2 Mounted on a Sisu E13TP tactical truck. Ground Master 403 medium-range air defense radars – completed. Ämari Air Base reconstruction – completed. Ämari Air Base expansion – planned. ↑ Schnitzler, R.; Feuchter, G.W. ; Schulz, R., eds. (1939). Handbuch der Luftwaffe [Aviation Manual] (in German) (3rd ed.). Munich and Berlin: J. F. Lehmanns Verlag. p. 65. ↑ "Air Force". Estonian Defence Forces. Retrieved 5 March 2016. 1 2 3 Schrik 2016, p. 61. ↑ Eesti Õhuvägi – Õhuväe Staap, General Staff of EDF. ↑ "Estonia to replace Soviet-era An-2 aircraft". janes.com. 2015. Retrieved 4 January 2015. 1 2 "World Air Forces 2015 pg. 11". Flightglobal Insight. 2015. Retrieved 26 December 2014. ↑ "Eesti ostab koos Soomega uued õhuseireradarid". Eesti Päevaleht. 29 April 2009. Retrieved 25 December 2014. ↑ "Õhuvägi näeb 25 miljoni dollari kasutamiseks mitmeid võimalusi – Eesti uudised – Postimees.ee". Postimees. 22 December 2014. Retrieved 25 December 2014. Gerdessen, Frederik "Estonian Air Power 1918 – 1945". Air Enthusiast No 18, April – July 1982. Pages 61–76. ISSN 0143-5450. Humberstone, Richard. Estonian Air Force, 1918–1940 (Insignia Air Force Special No.3). London: Blue Rider Publishing, 1999. Schrik, Cristian (2016). "On the Front Line". Air Forces Monthly (234): 60–63. Wikimedia Commons has media related to Air force of Estonia.